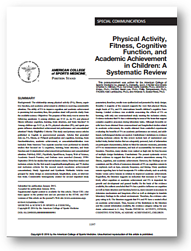 Does Incorporating Physical Activity Improve Student Outcomes? Walkabouts do more than make language arts, reading, and math fun. 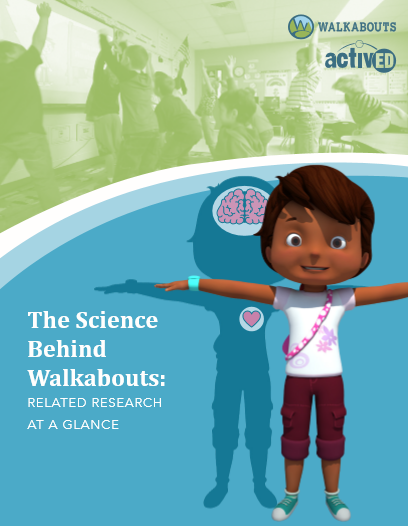 Walkabouts are researched-based, and each online adventure engages students in kinesthetic learning. Learn more about the scientific foundation of Walkabouts in the following articles. Independent researchers at Iowa State University and the University of California at Irvine examined the impacts of Walkabouts as a supplement to traditional lessons versus controls with traditional lessons alone. 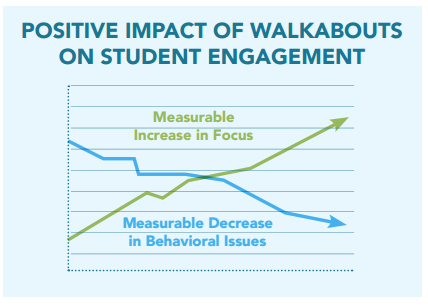 Pre-K to 2nd grade students exposed to Walkabouts’ standards-aligned, physically engaging lessons for eight weeks showed significant improvements in inattention and hyperactivity. Download the abstract, and check back for more information as it becomes available. ActivEd and Walkabouts were inspired by years of published research about both education and health—and the correlation between the two. Dr. Reed’s findings and his work to help equip and empower teachers across the country continue to inform all facets of the Walkabouts platform. Active students had nearly 1200 pedometer steps per activity day and averaged 3600 steps per week when active. Students who exercised had improved outcomes on achievement tests and performed significantly better in fluid intelligence testing compared to students who did not exercise. 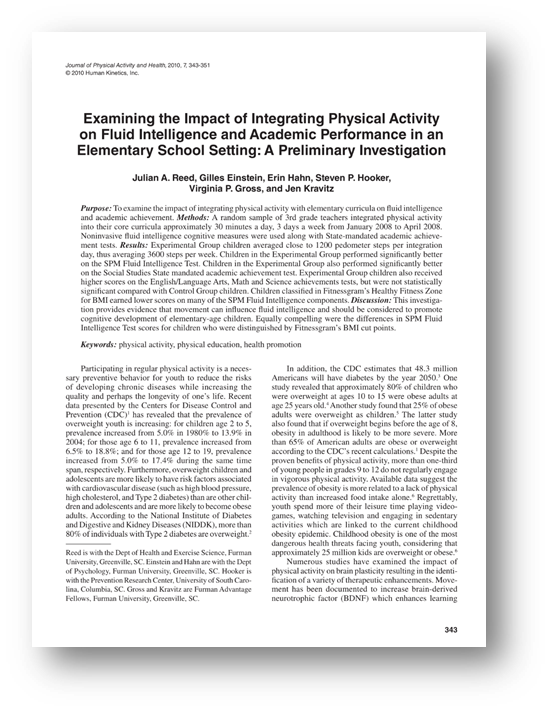 Read more about this study to find out how your district can improve student outcomes through integrating physical activity in the classroom! Students participating in physical education showed increased results in cognitive measures. Active students improved in fitness and body composition measures. 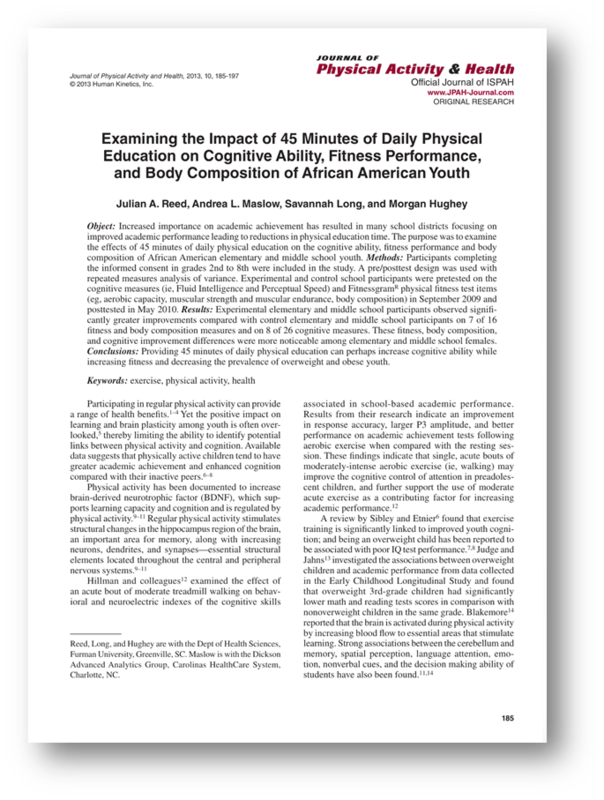 Download the research to learn more about the impact of physical education on African American students. Interested in reading more? Buy the book! Joseph E. Donnelly, Ed.D, FACSM (Co-Chair); Charles H. Hillman, Ph.D. Co-Chair; Darla Castelli, Ph.D.; Jennifer L. Etnier, Ph.D., FACSM; Sarah Lee, Ph.D.; Phillip Tomporowski, Ph.D., FACSM; Kate Lambourne, Ph.D.;and Amanda N. Szabo-Reed, Ph.D. Physical activity has an impact on students in the classroom. 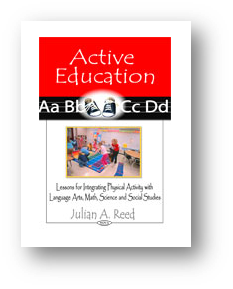 However, there are still questions regarding how best to incorporate physical activity in the classrooms. 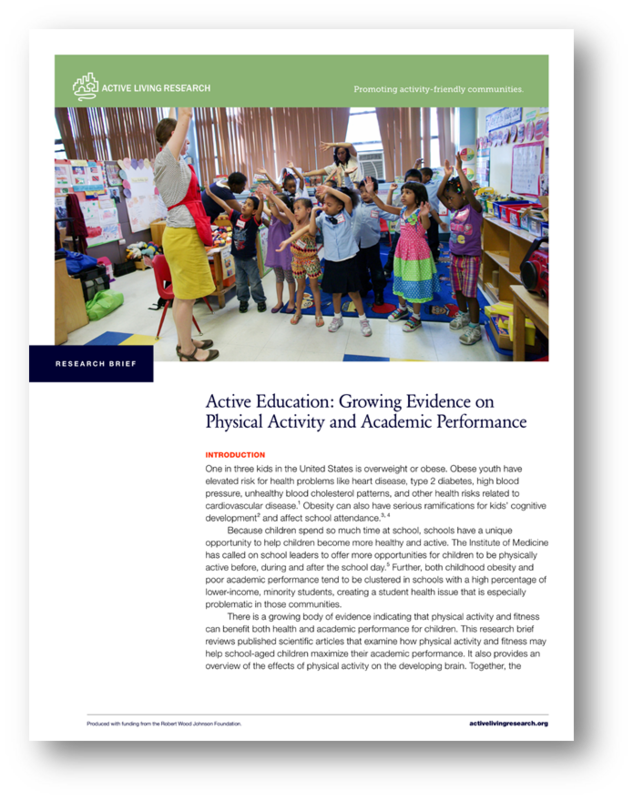 Download the research paper to get an excellent summary of what physical activity is proven to do in the classroom! 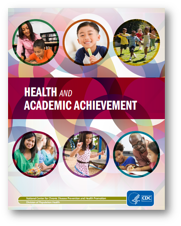 Get the report to learn how healthy choices can make a difference in your district. Active students do better academically. Students can enhance attention and memory in just one active session. Physical activity may improve brain health, explaining why student achievement improves after they are active. Go to Active Learning Research to view the full brief. 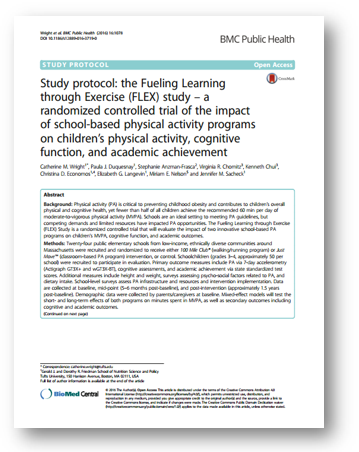 This study investigated the effects of an innovative, physically active academic intervention on the academic achievement of children. Active students showed significant improvement in mathematics and spelling. 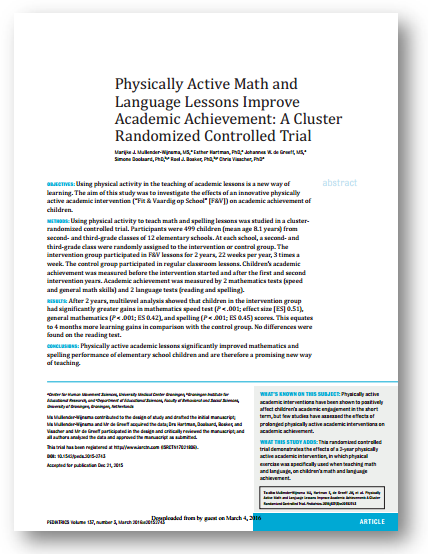 Over two years, physically active lessons provided a four-month increased learning gain as opposed to lessons not requiring physically activity. Download the research to learn more about this fascinating study. Download the research to learn more about this study. Ready to activate your curriculum with Walkabouts?